So many hugely inspiring, gorgeous interior photos on this flickr set... + those mismatched chairs, oh my. a big, rustic mirror like that needs to make its way into my home! 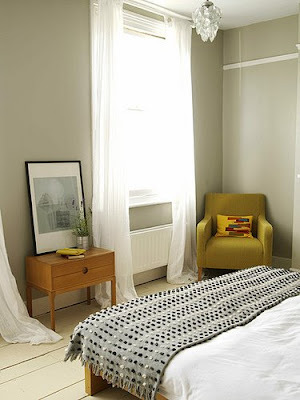 i love how quiet and clean that bedroom looks! you certainly have found the motherlode!! gorgeous. These are indeed lovely. Perfectly beautiful and serene, just as a home should be. Wow, that is a fantastic flickr find! that second image makes me happy!!! that table just rocks with the wicker chairs!! i'm not sure my life will be complete if i don't (at some point) have a huge rustic dining table. Perhaps with mis-matched chairs. Definitely in a beautiful, high-ceiling-ed, light filled dining room. amazing. love, love that table. 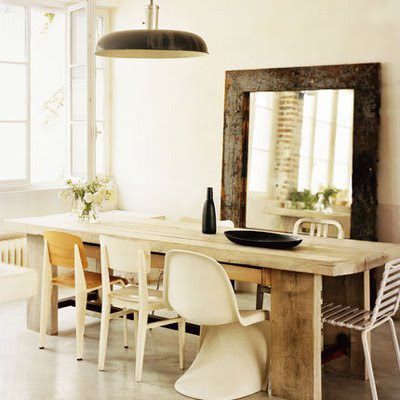 Inspiring pictures especially the the small 2 seater dining table and the one in White. The Marie Claire Maison pic is a great find. I would like to be invited to sit at that table for a dinner. wow, that is a gorgeous house! oh i love that first room. i just fell over and died over those first two photos. i cannot love the dining chairs in the second photo ANY more!